The weather wasn’t quite so co-operative this week with the stormy conditions causing a cancellation of the Thursday evening pursuit race and WASH Sailability on Saturday. However, the Toppers did go out on Saturday and, although it was rather too breezy for any serious team race training, had a lot of fun blasting around the Lake. On Sunday, the winds had moderated to provide ideal sailing conditions for the Mars Marathon day. Unfortunately, a number of people were away or injured, so the fleet was somewhat reduced. Carl Day and Alan Shaw, in their Enterprise, had a good battle with Chris Seears, sailing his Streaker, in the first two races with Chris Styles, in his Comet, chasing them hard. The Streaker just won on corrected time from the Enterprise in the first race, with the positions reversed in the second. In the third race, a pursuit, the fleet was joined by Fliss Elsom-Cooke and Charlotte Norrbom both sailing Vareos. Charlotte had a fantastic race just catching Carl Day’s Enterprise in the closing minutes, which was all the more impressive considering that it was the first time that she had raced on her own. The second place, however, was sufficient for Carl Day and Alan Shaw to claim the day prize of a packet of Mars Bars. Meanwhile, a number of the new younger members were seen out crewing for their fathers in various Club boats, which looked like quite a pleasant way to spend Fathers’ Day. 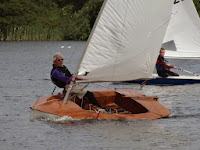 Next weekend sees the Sea Cadets out again in force on Saturday and racing for the Midsummer Madness trophy on Sunday. This is followed by Culford School sailing on Monday, WASH Sailability on Tuesday, Young People Afloat sailing on Wednesday and the Club Evening Pursuit Race series continuing on Thursday.